There are several features that make Root and it's companion software (called Root Square) unique. I want to mention some of them here. In the classrooms of many countries, the whiteboards are metallic. 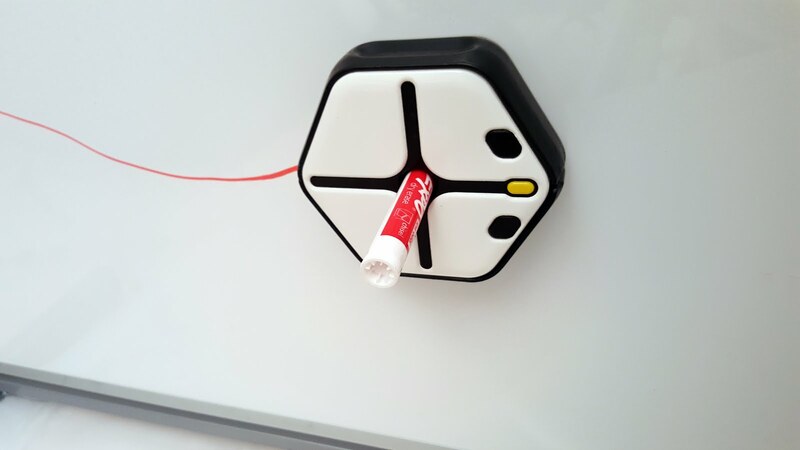 This makes it possible to attach magnetic accessories to them (like the ones we attach to our refrigerators). 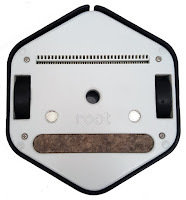 Root is a magnetic robot; although it can work perfectly over a table, the floor, or over a piece of paper or poster board, it can also work vertically on a magnetic whiteboard. This is not a minor detail: the whiteboard is a great tool/arena for building the world with which the robot interacts. 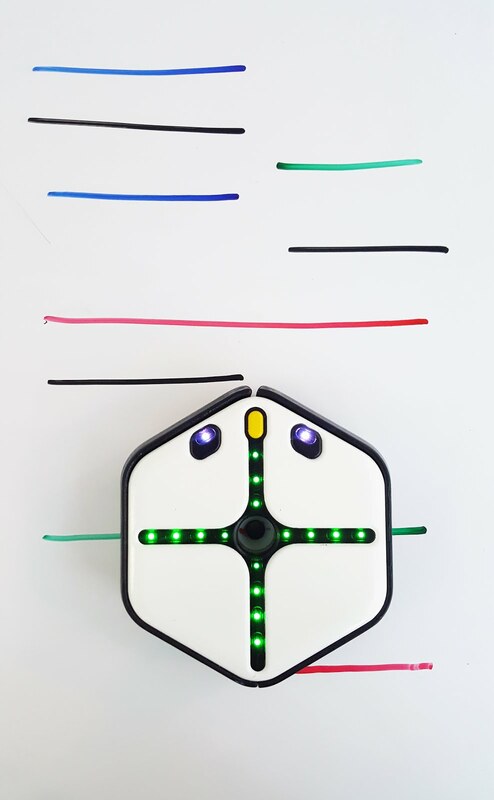 This can even be done while the robot is running, in an interactive way, opening up a lot of unique activities. 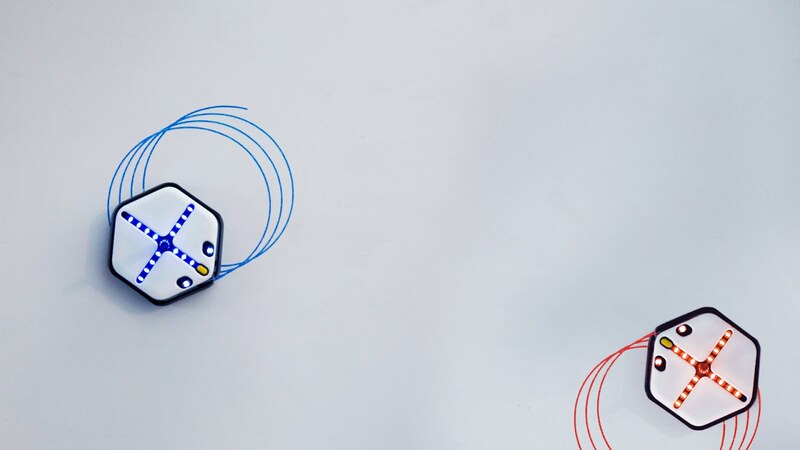 Additionally, whiteboards offer another big advantage: if you have ever seen a robot competition, you probably know that creating the physical environment for the robot to compete is often complex and expensive. But whiteboards allow us to build complex 2D worlds by just drawing, which is in itself an interesting activity. 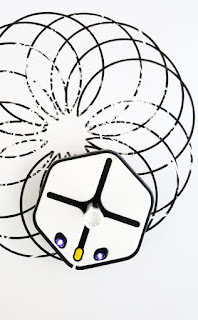 Not any magnetic robot can live in a whiteboard. Root features some important elements that makes its life there easier and, let's say, much more productive. But, Root can draw with high precision, due to a big set of internal sensors (high resolution encoders, a 3D accelerometer and a 3D gyroscope) that work together with its precision motors. This feature is more complicated that it first appears because Root must compensate for gravity (which should not be underestimated). 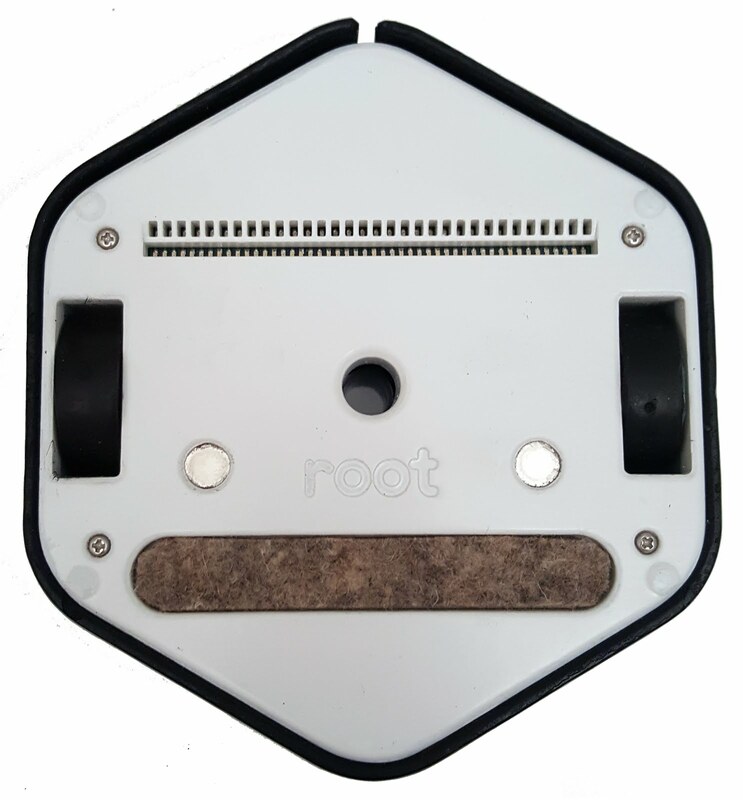 One should note that Root is not only meant for basic activities, it's one of the robots equipped with most sensors in its market segment. In addition to the previously mentioned 32 color sensors, hi-res encoders, 3D accelerometer and 3D gyro...Root features 2 ambient light sensors, 4 touch areas on its top, 2 bumpers, an internal battery sensor, and 4 magnetic surface sensors on its bottom (which allow it to improve the way it drives on metallic surfaces). Regarding expansion, third party boards and other accessories (like Raspberry Pi, Arduino, BBC Micro:Bit, cameras, sensors, etc.) can be connected through an USB-C connector on the robot's back. 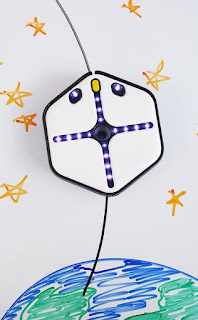 Root has also 16 multicolor (RGB) LEDs, and a piezo speaker with which it can play musical notes. For connectivity, Root can talk to any Bluetooth Low Energy device, like most modern tablets, mobile phones, laptops and desktop computers. It's probably the most interactive programing environment for robots out there: Not only does it not need compilation, but also the user's program can be modified while it's running. This puts Level 1 in a very different category when compared with traditional interpreters. Adding, deleting or modifying instructions (blocks) even inside a running loop is absolutely possible; the user's program will just keep running with the new modifications. This capability makes it ideal for working with young kids, as they are really playing with the code while it runs. This also facilitates introducing programming in the classroom, where time is always at a premium. No more slow compile, upload and test cycles. It's been optimized for touch screens. Many currently available robots can be program now with graphical programing languages. Most of them follow the same paradigm which, let's say it, it's based in developments mainly done between 1995 and 2005 (so let's put it clear: this was 21 to 11 years from now). Square was designed breaking some of the "accepted rules", which were no more than just legacy stuff designed for desktop computers. There has been a lot of effort invested in optimizing the relationship between the number of elements (blocks) that build a program, and the powerfulness of that program. This means that in Root Square, the user programs are short when compared with other graphical languages currently in use. But being short does not mean at all that the algorithm is hidden or not designed by the user. The student must still create each rule or response for the robot. Level 1 is completely events-based and thus with very few blocks it's possible to solve complex situations that in other environments require far more syntactic complexity. Often, the programs can run exactly the same as in other environments, but the Root Square program is shorter and easier to follow. I would like to explain more about this, but let's leave that for a future post. I hope to publish more about Root's details during the upcoming weeks. For now, the most important thing is to make it happen. Everyone can help through the Kickstarter campaign. Thanks!